Fire and thick black smoke spewed from one of the world's longest road tunnels after two trucks crashed head-on Wednesday, trapping motorists. At least 10 people died, police said. Intense heat and smoke kept rescuers from reaching the crash site for hours, and the death toll was expected to rise, said Benno Buehlmann, chief of the Swiss state's chemical department. Many motorists and truckers managed to reach emergency exits on the more than 10-mile-long Gotthard Tunnel, which cuts through the Swiss Alps and is a key connection between northern and southern Europe. "Without the safety shelters, we would have many more victims on our hands," Buehlmann said. The 10 dead included one of the truck drivers, said Mario Ritter, spokesman for Ticino state police. The surviving driver, Bruno Saba, told reporters he was heading south when he saw the other truck veer out of control, smash into his vehicle and then slam into the tunnel wall, trapping the driver in his cab a mile from the southern exit. "I was able to climb out and help other people escape," Saba said. Rescue workers were deployed within a minute of the Wednesday morning crash as thick smoke fueled by a load of tires on one of the trucks billowed out of the tunnel, officials said. "Suddenly there was smoke and I couldn't see anything," truck driver Marco Frischknecht told Swiss television from his hospital bed. "I tried to reverse, but there were so many people I had to give up." Frischknecht, who drives through the tunnel every day, said he abandoned his car immediately. "I felt my way along the wall until I got to the emergency exit," he said through an oxygen mask. Some died trying to reach the shelters or in their cars, authorities said. But many people were able to escape, Swiss President Moritz Leuenberger said, thanks to the tunnel's ventilation system and emergency exits and shelters positioned every 250 yards. Others were able to turn their cars around and drive out of the single-bore, two-lane tunnel, police said. Once the cars were cleared, a number of trucks were able to back out. Six people were treated for smoke inhalation, officials said. Officials were unable to say how long the Gotthard tunnel would remain closed. "It's certainly not a matter of just a few hours," an official at the tunnel's road maintenance office told Reuters. A police official said the tunnel was likely to remain closed for "several days." Built in 1980, the Gotthard has had increased traffic since a 1999 fire forced the closure of the Mont Blanc tunnel between France and Italy. That tunnel blaze killed 39 people. Repair work on the Mont Blanc Tunnel began last year, and it could be open again within months. 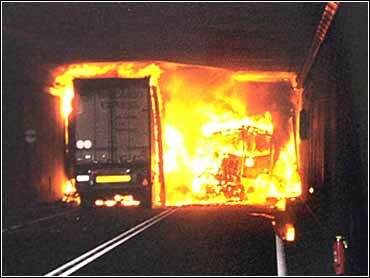 In May 1999, two months after the Mont Blanc accident, 12 people died in the Tauern Tunnel near Salzburg, Austria, after a truck plowed into the back of a car, setting off a chain of explosions. Even before news of the deadly accident emerged Wednesday, interest groups had either campaigned for a reduction in traffic or for the construction of a second tube to the tunnel which would allow traffic lanes to be separated. "This was an accident that was waiting to happen. The Gotthard tunnel has just one lane in each direction in a single corridor," said Markus Gisler. Gisler is a member of the local parliament of the canton or state of Uri and a prominent campaigner for a second Gotthard tunnel. The Gotthard's north entrance is in Uri. "Any accident is one too many and this fire in the Saint Gotthard tunnel is all the more poignant because of its echoes of the Mont Blanc tunnel fire in 1999," said David Green, president of the IRU International Road Transport Union. He said the number of major road transit routes across the Alps had been reduced to two -- the Brenner in Austria and the Frejus in France. "Movement of people and goods to and from Italy will be greatly complicated to the detriment of the European economy," Green said. Gotthard was the longest road tunnel in the world until Norway opened its 15-mile Laerdal Tunnel last year. More than 1.2 million trucks and millions more vacationers passed through the Gotthard last year.